1. Before planting your tree it is advisable to remove any vegetation within a 0.5m radius, including grass, as trees establish and grow faster without any competition. If you can't apply a herbicide in advance then it's best to remove as much of the vegetation as possible, using a spade, hoe, mower or strimmer as applicable. 2. Before the tree, soak the tree roots in a bucket of water for around 10 minutes. In the case of cell grown trees, puncture the black stretch film top and bottom before soaking. Try to only remove the black stretch film just prior to planting, to avoid any unnecessary damage to the roots and to keep the growing media intact. 3. Dig your hole. It should be roughly twice the size of the pot, with room at the sides and at the bottom. Prick the sides of the hole with a fork to make it easier for the roots to break out into it. Give the hole a generous watering. 4. Fill the bottom of the hole with a mixture of compost/manure and top soil. If you have dry soil then the soil in the pot should be slightly below ground level, if you have very wet soil it should be slightly above. Otherwise it can be in line with the current level. 5. Remove the Air-Pot by unscrewing the green fixings on the side. Remove the Air-Pot wall and the slotted base before planting. Place the tree in the hole and position it. 6. Before back filling the hole, place the stake into position and hammer into the ground (you may need to take the tree back out of the hole to avoid being damaged). 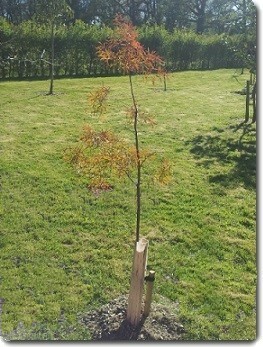 NOTE ON STAKING: There are many different views on the staking of trees. 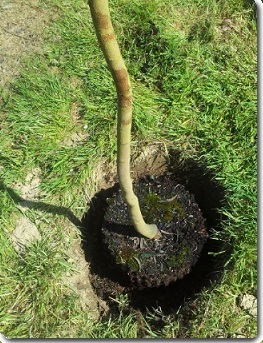 Most modern techniques indicate that staking is for the benefits of the roots, not to make the tree grow straight. Low stakes at a height of 1-2ft (30-60cm) are preferable. At this height they hold the root ball in place and help cause minimum damage from root rock when the tree moves in the wind. 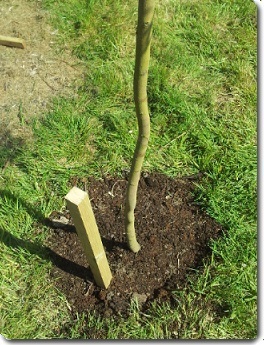 Using a taller stake can be a very bad idea with Eucalyptus. Being fast growing trees they have a tendency to shoot up and if they have a nice firm stake to hold them up they won't waste any energy into growing a strong trunk. Once the stake is taken away the tree will just flop over. Trees in this condition will not recover and need to be pruned back and allowed to grow again. 7. Back fill the hole with more compost and top soil, firming as to go. Once the soil is level you can use your foot to really firm it down. 8. If you are using mulch mat, now is the time. 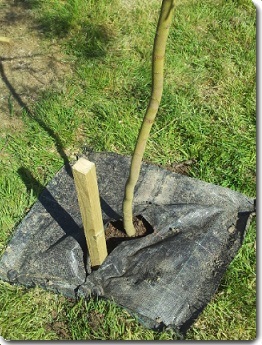 Cut a slit to fit around the tree and stake, use the pegs to secure it to the ground. 9. If you are using a tree shelter or spiral guard you can put it on now. Incisions can be made to allow for a tree tie. 10. Attach the tree tie to the stake, and then around the tree. The tie should be loose enough so that it does not pull the tree towards the stake but just tight enough to give support. You should check your tree tie a few times in a year to make sure it is not causing damage to the growing tree. 11. Water the tree very well, wait for the water to soak in and do it again. The most important things you can do now to help your tree establish are the three W's: Water, Weeds and Water. 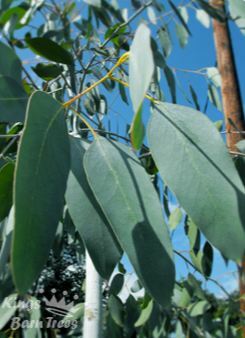 Eucalyptus are thirsty trees, for their first year make sure so water regularly and well. 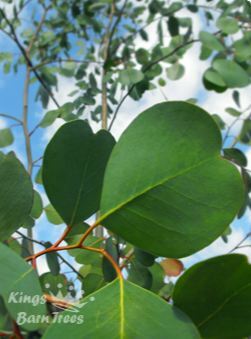 When Is The Best Time To Plant Eucalyptus Trees? The answer really depends on where you live. What needs to be avoided is freezing the roots of the young Eucalyptus tree before it's established. The following guidelines look at the pros and cons of when to plant. If you delay planting or want to store your plants until the weather improves, please keep the plants in a sunny, frost free area. It's important to protect them from the frost because the roots are more susceptible being out of the ground. 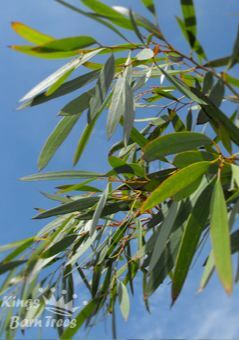 The advantage to planting in late spring - early summer is that the Eucalyptus tree has all summer to establish whilst it's growth is most active. We would recommend this planting time if the winters in your area are particularly harsh as it allows the roots to fully establish well before the cold weather / freezing conditions set in. Plant only after the danger of frosts has passed. 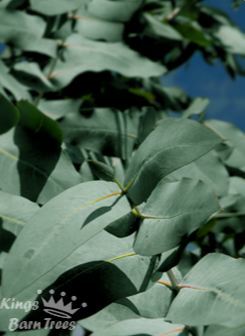 As our Eucalyptus trees are cell or container grown they can be planted during the summer. However, it is vital that they are kept watered, expecially during very dry periods as the roots will not have established sufficiently. We successfully plant cell grown Eucalyptus trees during the summer but we check them regularly. 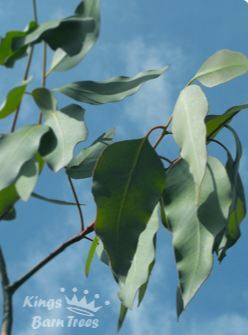 Container grown Eucalyptus trees are more resiliant to the summer's dry periods as they have a larger root system, but it's just as important to keep these well watered. 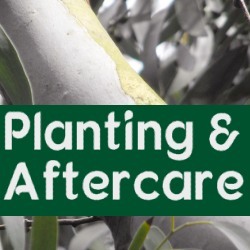 This is a good time to plant as the Eucalyptus tree will in most places get a good watering whilst simultaneously, the tree won't be so demanding for water. Being evergreen, the Eucalyptus tree will continue to grow through the winter and should be well established for the next year. 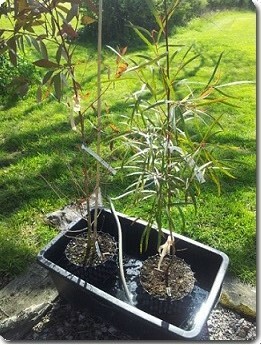 In milder climes it's OK to plant cell grown Eucalyptus trees at this time of the year. In colder areas we would recommend container size Eucalyptus trees but in very cold areas, of if in doubt, we would recommend planting in the spring. What needs to be avoided is the roots freezing before the tree is established. To protect the Eucalyptus roots from freezing conditions we suggest using a thick mulch mat, like old carpet for example, topped with a very generous thickness of mulch. This needs to be at least 600mm radius, possibly more in very cold areas. Plant at any time of the year but be careful if it's in a conservatory which may freeze in the winter or 'cook' in the summer. Don't forget Eucalyptus trees need plenty of light! In the inital stages of growth after planting there are two main concerns, water and competition. Eucalyptus trees don't need very fertile soil or fertiliser to survive but they need water. Make sure they get enough water but don't make the mistake of drowning them or overwatering them. If the competion for water and nutrients are 'neutralised' then the Eucalyptus tree has them all to itself. Keep the area around the Eucalyptus tree free from grass, weeds and flowers using herbicides and or mulches. Mulches are very good as they also help keep the moisture in the ground as well as keeping competition at bay. 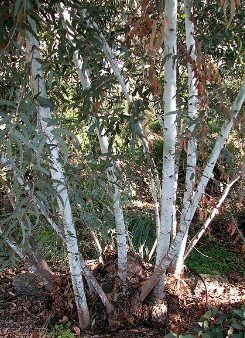 In some areas Eucalyptus trees may come under attack from rabbits, deer and other browsing animals. Most Eucalyptus trees grow so fast that once established they quickly grow out of the reach of most animals. This does not stop the animals from ripping or stripping the bark off the trunk. There are numerous protection systems available for many different situations; it's best you choose a method to suit your circumstances and planting arrangement. Eucalyptus trees will grow better with wide and well ventilated protection rather than thin unventilated grow tubes.